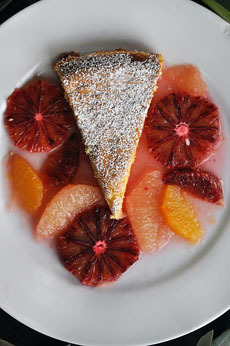 With a limited offering of sweet fresh fruit during the winter, turn to seasonal citrus to dress your desserts. Angel cake, cheesecake, olive oil cake, pound cake, sponge cake: all are highly receptive to a garnish of citrus segments (or, depending on how you look at it, a citrus fruit salad). In addition to cheery color, if you use the citrus as a base you can place a smaller piece of cake atop a larger amount of fruit. Go for a blend of color—rosy blood oranges, pink cara cara oranges, conventional oranges, pink or red grapefruits (with perhaps some white grapefruit for contrast). You can also add some kumquats and something from the Mandarin group: clementines, satsumas, tangelos and tangerines. Cut some of the fruits into disks, and supreme others into segments. “Supreme” is the term that refers to removing the skin, pith, membranes and seeds of a citrus fruit and separating it into segments (wedges). Here’s a YouTube video showing you how to do it. One note: You may not want your cake sitting in the citrus juices. If so, be sure to drain the citrus well—but save those delicious juices and drink them or add them to a vinaigrette. A mandarin is erroneously called “mandarin orange”, but the two are separate species. Even Produce Pete calls clementines and mandarins “oranges,” so do what you can to spread the truth. There are three basic citrus types—citron, mandarin and pummelo—from which all modern citrus derives via hybrids or backcrosses. While they look like small oranges and are often called “mandarin oranges,” mandarins are a separate species that includes the clementine, mineola (red tangelo), murcott (also called honey tangerine), tangelo, temple and satsuma, among others. Oranges are from the order Sapindales, family Rutaceae, genus Citrus and species C. × sinensis. They are believed to have originated in southern China and northeastern India. They were first cultivated in China around 2500 B.C.E. Mandarins are from the order Sapindales, family Rutaceae and genus Citrus but differentiate at the species level: C. reticulata. Reticulata, Latin for reticulated, refers to the pattern of interlacing lines of the pith. 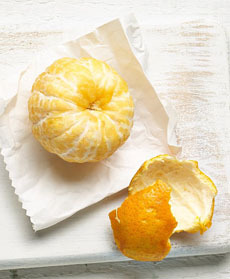 Mandarins, which originated in Southeast Asia, are also identifiable by their loose skin. According to the horticulture experts at U.C. Davis, the mandarin reached the Mediterranean basin in the early 1800s, and arrived in Florida about 1825.You can read more here.